There is of course a catch, and that is the cost of purchasing and installing the necessary equipment. This isn’t cheap, and in fact for a domestic 3kWp system, which is around the size necessary for most homes, will cost around £13,000.00. This used to be a barrier to a lot of people who do not have the cash and are unable or unwilling to take out a loan. However, since the introduction of the feed in tariff whereby home owners are paid for each unit (kWh) of clean energy they produce, several companies are offering to supply and install the equipment completely free, in exchange for receiving the tariff payment. That way you get the benefit of reduced energy bills without the initial outlay. Why Would a Company Give Me Solar Panels For Free? From 01 April 2010 the feed-in tariff scheme commenced. This is a scheme whereby any property owner who installs a qualifying renewable energy system, such as solar panels, is entitled upon registering the system to claim a payment of 41.3p per kWh of energy it produces. Dependent on the size and location of the system it could generate as much as 2750kWh per year. If all of this were to be used by the property this would equate to an annual payment of over £1,100.00. In fact not all of it will be used by the property but at least half should be. What is not used by the property will be exported to the National Grid at a rate of 3p per kWh. This payment is guaranteed for 25 years and it is this payment that the installers are after. In reality therefore the system is not free. In fact the installer will receive a minimum of probably £17,000 – £18,000 from tariff payments compared to the £13,000 they would get from selling you the system outright. What Do I Get Out of Free Solar Panels? If you have the cash available then you would eventually be better off buying the solar panels outright, however that is a big “if” for many people. If you don’t have the cash then this type of arrangement can be a good way to take advantage of the fuel bill savings that are available. 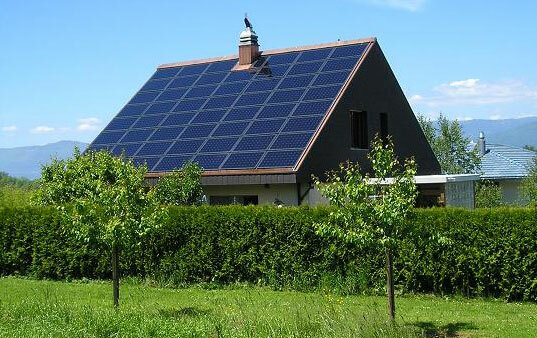 On average solar panels will produce around 40% of a home’s annual electricity needs. That means of course a 40% saving on your annual fuel bill. Currently that might equate to around £150 per year however as electricity prices rise the savings will of course become more pronounced. There are other factors to consider. Some commentators for example think that the feed-in tariff may be closed to new applicants more quickly than expected if take up is too high. If that happens then something else will need to be done to ensure emissions targets are met. This could mean measures like higher council tax bills for those homes with high emissions or restrictions on the use of certain appliances if only electricity produced from fossil fuels is used. If the feed-in tariff is scrapped then certainly private companies will not be offering free systems! We’ve been unable to find a satisfactory answer to this question as yet. The equipment will remain the property of the installer. You may be able to take it with you (with the installer’s consent) but you would probably have to pay for the removal and re-installation costs. If you sign up for free solar panels then you will have to enter into an agreement with the installer, the crux of which will be that in exchange for the equipment and installation you will allow the installer to house the equipment on the property and to claim the feed-in tariff payments for the next 25 years. The problem is that this agreement will still be binding on you and not the new owner after you sell. One of the most fundamental principles of contract law is that any term can only be enforced by or against an original contracting party (this is known as “privity of contract”). The effect is that if the purchaser of your property decided he didn’t want solar panels, or he wanted to install his own and so claim the tariff for himself, he could remove the existing panels and because the installer has no contractual relationship with him it could not take any action, but it could sue you for breach of contract. Presumably it will be necessary for you to ensure that the purchaser enters into a new contract with the installer from completion, on the same terms as your own, and that your own contract has a provision for termination on sale provided the purchaser does enter into a new contract. Of course the purchaser may not want to proceed in which case another buyer would need to be found. Who Will Be Responsible For The Equipment? The equipment will remain the property of the installer so it should be responsible for any maintenance, repair and insurance. You should check that this is the case and check what would happen if the equipment caused damage to another’s property or injury to another person, for example a result of an electrical fire. You should also speak to your own buildings insurer to check whether you need to notify them of the installation and how your cover and premiums may be affected, for example if the equipment is damaged as a result of vandalism would your insurance cover this? What if the roof collapses under the extra weight? What Happens When The Feed-In Tariff Payment Ends? Once the tariff payments come to an end ownership of the equipment should be passed on to you for no charge and this should be a term of your agreement, but you should check this. Make sure that there is no provision for the installer to remove the equipment or to charge any kind of a “hand over fee”. Will I Need My Mortgage Lender’s Consent? As alterations will be carried to the property which could affect its structural stability as well as its value it will be a condition of most mortgages then the lender’s consent is obtained, though it is true that similar works are carried quite often without the lender being informed. They will presumably want to see evidence of building regulations approval, they may want to be a party to the agreement with the installer or have it checked by their solicitors and they may want to seek the opinion of a valuer as to the affect the changes would have on value (in which case this would be at your expense). Are There Any Other Catches? You will need to read all of the small print carefully. In particular check that you will not be charged any kind of one-off payment or monthly fee. If your property is quite far north or your roof isn’t south facing then the installer may make these charges to “top up” the tariff payments, which would be lower than for better positioned properties. Check that you get to keep all of the fuel savings. The agreement you sign with the installer will impose legal obligations on you and grant legal rights to the installer and as such it is recommended that you seek independent legal advice before signing. Im happy to say that all boxes are ticked by our Company – if you need any more details then please visit our website for an honest, transparent and informative guide to free Solar Panels for the Home. Thanks for your comments are you able to expand a little? What boxes have you ticked that you refer to? What happens when you move house? Are you able to take the panels with you and who would pay re-installation costs? I think Joe is referring to the points in your post, however it would be useful if he specified which points and maybe throw in a few numbers. In my experience the panels stay with the house, you cannot move them. The new owner takes ownership. This should not be seen as a negative point but an additional selling point. Can’t quote any stats but I read it increases house value and is more likely to sell your home. As you raised the point I think most new contract refer to renting the roof space although I too would like that particular matter cleared up too. Most of the free schemes are lease schemes that attach a charge on the property which is registered with the Land Registry, this means that any subsequent purchaser must decide to continue the contract, (as it is part of the home they’re purchasing. Some of the providers do not allow straight purchase of the system within the 25 years lease but if it came to a court case there is a degree of agreement by many in the industry that the suppliers would in fact be forced to sell the system to the property owner if required. This, to our knowledge has not yet been tested, so please do not take this as gospel! There are however other schemes that are not Lease based, I would be happy to provide you with information on those schemes if you, or anybody else, would like to email me. Having looked into this a little, the figures quoted to make a purchase of a pv system, (along with the feed in tariffs and savings to the homeowner), make investing in a system a no brainer, with what appears to be great returns over a long period. However, I like many others cannot afford the initial investment, (nor do I want to take the risk of an additional loan or the panels ceasing to work) – so I figure it is better to go free than not at all, the savings aren’t great in comparison but I’m all for a greener life. We advise on free installations with various companies and organise installations. There are some areas that are important to consider, by all means email me if you would like more specific information about the various schemes and different providers. One key point though that may resonate with you is that we only advise people to sign up with providers that allow subsequent purchase of the system at any point in the contract. The logic for this is that nobody can say what may or may not be somebody’s position in 5 or 10 years and they may be in a position to purchase a system thereby benefitting from the Feed In Tariffs themselves. Also there may well be the possiblity of using the Green Deal or special offers from various financial institutions to fund their purchase.By all means email me for more info. We are Independent renewable Energy Consultants advising people on purchase/free installations. You suggest that you would be interested in offering some of these products in various products. I would be interested to hear more about where you are based, your sector interest and what your ideas would be as we may be able to help. Please email me directly and i will come back to you. Is there a reason why a charge placed on the property and registered with the Land Registry, would stop the fitting of free solar panels? The charge on the property relates to my late fathers estate and it is 1.6% of the value of the property?